Hotel Sol Rio de Luna y Mares Resort is located in a setting of unique beauty alongside Playa Esmeralda, Holguin Province. This idyllic spot is considered privileged because of its ecological attractions which make it an ideal place for those who wish to be in contact with both nature and the sea. 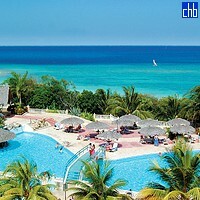 This 4-star All Inclusive Resort consist of 2 parts: Rio de Luna and Mares and has 464 rooms between them. Hotel Rio de Luna & Mares offers to its guests a wide range of services and fascinating attractions. Here you will find restaurants and bars that offer international and Cuban cuisine, fantastic swimming pool surrounded by lush tropical gardens, courts for different sports, sauna, gym, diving school for the delight of sports lovers, snorkelling and many more. Varied daily activities programs especially designed for children and adults make this hotel an attractive destination for family vacations. The beach at Sol Rio de Luna & Mares is wonderful! Soft, sugar-white sand and clear turquoise blue waters! It is just magnificent! 214 Double Standard room are beautifully decorated, have a balcony or terrace and an excellent view of the sea or garden. Queen-size beds, with the possibility to add more. 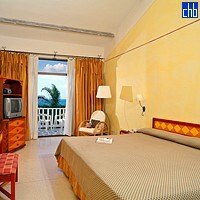 The 6 exclusive Junior Suites are located in the Mares area of the resort. They offer stunning views of the sea or the hotel gardens and are tastefully decorated. Rooms are equipped with all the facilities you need for an excellent holiday and they provide a hall, bathroom, lounge-dining area, bedroom with bathroom and terrace. Standard Ocean View Rooms at Sol Rio de Luna & Mares Resort have a beautiful view of the sea. 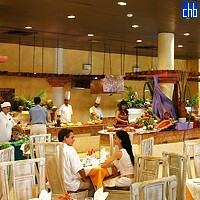 All have been beautifully decorated and equipped the necessary comforts and excellent service. The 30 Superior Ocean View Room at Sol Rio de Luna & Mares Resort are located on the 3rd and 4th floors of the bungalows and surrounded by beautiful natural beaches. The rooms measure 40 m² and are tastefully decorated in tropical colours. They are equipped with all the facilities you need for an excellent holiday, including air-conditioning, a minibar service, king size bed, bathrobe and much more. Stunning ocean views can be admired from the specious terraces. Guests staying in these rooms will also have access to the WiFi free of charge. Family Room at Rio de Luna y Mares Resort are perfect for large families as they measure about 170 m² and provide an hall, bar-kitchenette, lounge, two bedrooms with bathrooms and a large terrace. They can accommodate up to 5 people.